The party speaker, priced at Rs 12,990 has a light show that syncs to the beat of the sound. The 40W output in compact size, brings alive a 360-degree sound field experience. 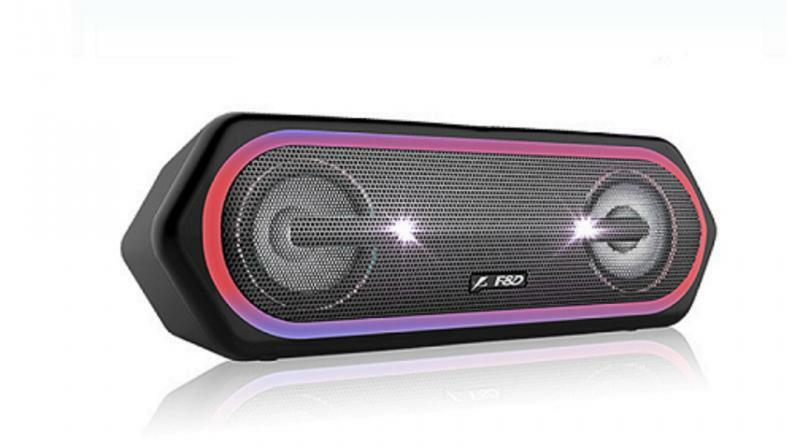 F&D has announced its new range of party speakers and the first one from the lot is the W40 portable Bluetooth speaker. The speaker comes with flashing lights and is said to have excellent bass that sets the scene for a club night. It features a glossy panel and a slim profile that features a wow factor to the listening experience. Take it to a party and feel the night come alive, with built-in colour changing RGB LED light band and a flashing strobe, see and hear the beat. It also features TWS technology whereby connecting two of the same speakers enable a stereo sound. The 40W output in a compact size brings alive a 360-degree sound field experience. The 2.5-inch full range driver with mega bass, brings good low frequencies, while the F&D sound Technology, adds rich detail for high-quality sound in every track. Guaranteeing long playtime with 1800mAh Li-ion battery, and 20m range the connectivity options include Micro SD card/TF and AUX cable. Its high-quality Bluetooth also supports the TWS function. With the built-in FM Radio function, a tune-up to your preferred channel and enjoy the radio, anytime, anywhere. Available in shades of grey and black, it’s now available from the leading retail and e-commerce stores across India for Rs 12,990.